Patience Karten No. 240 was published by Conrad Ludwig Wüst around c.1910-16. 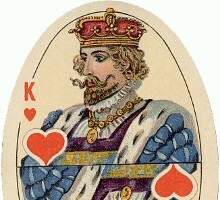 The deck is sometimes referred to as “Monte Carlo” playing cards. This version has German indices (A, B, D & K, with “X” for 10's) placed in the outer borders. As can be seen, the fantasy double-ended court cards are beautifully designed with the suit symbols elegantly inlaid into the design. Each end is separated by a straight, horizontal line. The back design is a pink floral pattern with the maker's name inscribed at each end. A green version of this back design was also published, as well as different floral backs for export to USA and Canada. 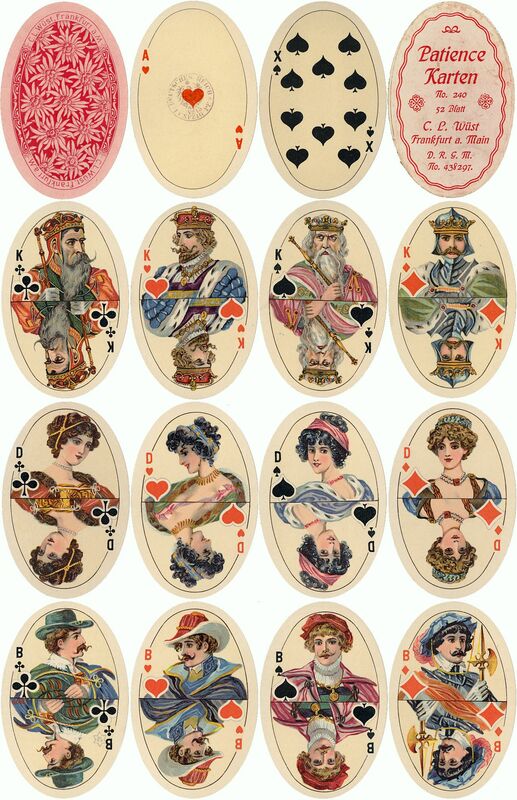 Above: oval patience playing cards published by C. L. Wüst, Frankfurt am Main, Germany, c.1910-16. Printed by chromolithography. The company logo, a star with the initials CLW inside, can be seen on the Jack of Clubs. 52 cards (no Joker); 54x83mms. The initials D.R.G.M. stand for "Deutsches Reichsgebrauchsmuster". Images courtesy Barney Townshend. C. L. Wüst was eventually taken over by the Vereinigte Altenburger Stralsunder Spielkarten Fabriken AG (V.A.S.S. ), Altenburg (1931-1945).